Are you stressed and need a break? There’s nothing better than a Pilates holiday in Tuscany! I’ve just come back from a wonderful week in a Tuscan villa and I feel so relaxed and full of energy. I feel like I can now face my daily routine in a different way. The Pilates lessons have definitely helped me: as everybody knows, Pilates is not only a good way to keep fit and young, but also to enhance the relation between body and mind and improve your lifestyle. 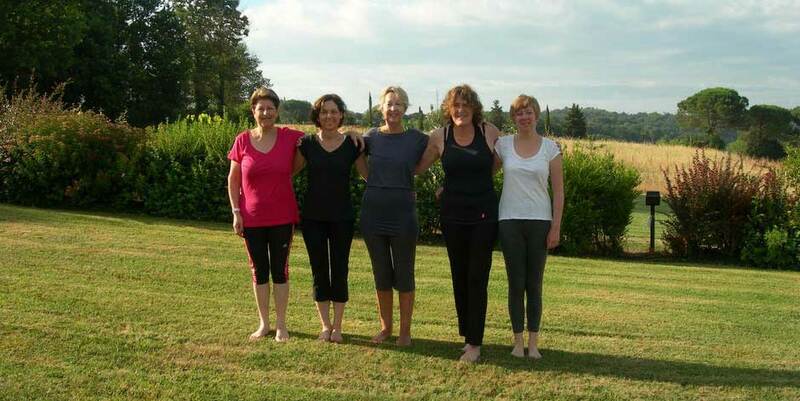 Pilates surrounded by the gentle hills of Tuscany – a chance you cannot miss! Our villa, deep in the country, was the perfect place to experience the benefits of the lessons. Doing exercises in the open air, in the morning or in the evening, is the perfect way to enjoy both the Tuscan surroundings and the benefits of Pilates. The first thing that you will notice is the clean and clear air around you making it easier to focus on breathing. Being in contact with nature activates your five senses: the beautiful and evocative scenery around our Tuscan estate doubles the effect. During the Pilates lessons, I could delight my eyes with views rich in spring colours, green meadows and lines of olives groves, all on the blue and clear background of the open sky. Meanwhile, I could enjoy the peaceful sound of the Tuscan countryside, helping me relax and concentrate, and not noticing the time passing by. The scent of blooming trees and plants spread into the air; working outside on your mat on grass and among small flowers, makes me feel as if I was part of the landscape….could I ask for anything more? After the lesson, you can satisfy your appetite with tasty and healthy food, made by simple ingredients which only Tuscan cuisine can offer. Enjoy the amazing meals prepared for you by the chef! Moreover, I had plenty of time to visit and discover beautiful places and cities nearby, and learn a bit more about the culture of this impressive land. At end of this adventure, I cannot deny that my body felt revitalised completely, I felt released from every annoyance and worry I had before. What else could I add to convince you to enjoy this fantastic experience? Pilates lessons are really worthwhile, you won’t find a venue better than a Tuscan villa, you will feel pampered and everything around you will be just perfect…simply paradise!